The Bio-Mass of the Albany Region is one of the largest known. Australia has some 20,000 species of native flora. Of these 12,000 species can be found in Western Australia and over 8,000 species can be found within 100 km of Albany. Today we grow some of these plants for the domestic and export markets. 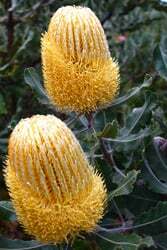 Currently 50 species are grown mostly Banksia, Waxflower, Eucalyptus, Boronia, Agonis, Ixodia ,Ozanthamus, Dyandra, Grevilla, Scholtzia, Regilia, Verticordia and Crowea.